They will stick to the core elements of the Trans-Pacific Partnership (TPP) agreed upon two years ago, but which the United States pulled out of in January. The deal substantially lowers tariffs on a wide range of goods and, even without the US, remains attractive, although some had sought to weaken its onerous standards. For Singapore companies, it offers access to a market of 500 million people with a combined output of US$10 trillion (S$13.6 trillion). The new pact - the Comprehensive and Progressive Agreement for the TPP (CPTPP) - suspends 20 provisions of the original TPP, mostly on intellectual property. It was reached on the sidelines of the annual leaders' meetings of the Asia-Pacific Economic Cooperation (APEC), a grouping of 21 economies set up to liberalise trade across the region. All the TPP countries are members of APEC. Japan's Economy Minister Toshimitsu Motegi said the CPTPP will enter into force after at least six members ratify it. Its members are Australia, Brunei, Canada, Chile, Japan, Malaysia, Mexico, New Zealand, Peru, Singapore and Vietnam. Speaking to Singapore reporters after the APEC Summit ended, Prime Minister Lee Hsien Loong said it took "a lot of skill and determination and willingness" among the 11 parties to agree not to renegotiate the pact, even though the circumstances have changed. "It is not easy to take the TPP that was designed for 12 countries, remove one and then have the remaining 11 reach an agreement almost the same as the original, because economic calculations change, strategic calculations change, and political calculations change." The deal appeared to hit a major roadblock on Friday when a planned meeting of TPP leaders was shelved as Canadian PM Justin Trudeau did not attend. His Trade Minister Francois-Philippe Champagne later put this down to "a misunderstanding about the schedule". Business groups cheered the deal, including the Singapore Business Federation, whose chief executive officer Ho Meng Kit said he "looked forward to the speedy conclusion and subsequent implementation of the restructured agreement". The Asian Trade Centre executive director, Dr Deborah Elms, told AFP that even without the US, the CPTPP was "the most important trade agreement signed in the last 20 years". "Companies had largely given up on the TPP after the withdrawal of the United States," she said. "Now, firms will need to scramble to figure out how the agreement matters to their business." Ever since US President Donald Trump withdrew the US from the TPP in one of his administration's first acts in January, Japan - the next-biggest economy in the group - has taken the lead in negotiations. Seven TPP members are also in talks on another trade deal, the Regional Comprehensive Economic Partnership (RCEP). Its 16 members comprise all 10 ASEAN nations as well as China, Japan, India, South Korea, Australia and New Zealand. Chinese Foreign Ministry official Zhang Jun told reporters in Danang yesterday that the CPTPP would not impact the RCEP's prospects. RCEP members held a 20th round of talks in Incheon last month and their leaders will meet at the ASEAN summit in Manila on Tuesday to review their progress. A roller-coaster of emotions. That's probably the most apt way to describe what the 11 nations involved in the Trans-Pacific Partnership (TPP) trade pact went through over the past few days. There were loud cheers and back-slapping among ministers and negotiators on Thursday night when it seemed they had, at long last, come to a consensus on how to move on without the United States. That jubilation dissipated the next day when a scheduled meeting of TPP leaders, on the sidelines of the Asia-Pacific Economic Cooperation summit here in Danang, was canned when Canada's Prime Minister Justin Trudeau did not turn up. His trade minister blamed it on "a misunderstanding about the schedule", and nothing more. To some, Mr Trudeau's no-show wasn't a complete surprise as he had stressed earlier that he would not be pushed into agreeing on a deal unless he was absolutely sure it was beneficial to his people. There was, however, to be one final twist in the tale. Early yesterday, all the trade ministers reaffirmed that they had an in-principle agreement to bring the pact into effect. Consensus was reached after 20 mostly intellectual property-related provisions of the TPP - now known as the Comprehensive and Progressive Agreement for the Trans-Pacific Partnership (CPTPP) - were suspended. The deal, thought to be stalled indefinitely, was back on the cards in a big way. While significant progress has been made, and the ministers deserve some credit for their steely resolve, there's still a long road ahead. A new legal text needs to be drafted and signed by all the parties. Only then can the 11 nations begin the tough job of winning their respective parliamentary approvals. Once that is done, a simple majority of at least six countries must ratify the agreement before it can enter into force. 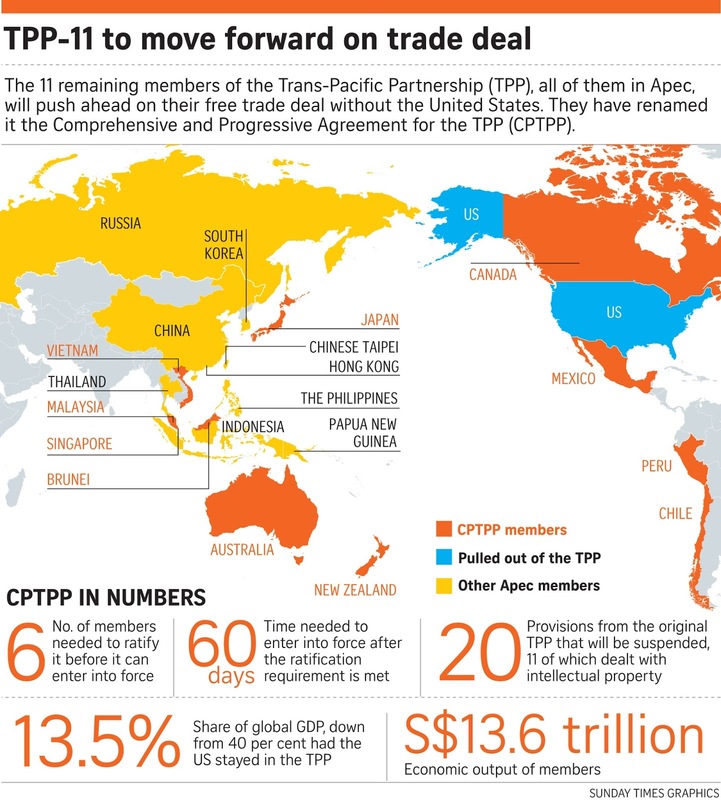 One of the biggest hurdles is convincing the naysayers the CPTPP can still be regarded as a "gold standard" free trade agreement (FTA), now that the US is formally out of the picture. The TPP would have been the largest FTA in the world, covering 40 per cent of global GDP. Though the new CPTPP accounts for only 13.5 per cent of global GDP, it still boasts a population of nearly 500 million and total trade in excess of US$5 trillion (S$6.8 trillion). These are still big numbers, and many countries will enjoy access to several new markets and improved access to others. Australia, for instance, will have new trade deals with Canada and Mexico, and greater scope to do business in Japan, Chile and Vietnam. When President Donald Trump yanked the US out of the TPP in January, it was as if the death knell had sounded for the ambitious grouping. The breakthrough, against the odds, in Danang has proven otherwise. The mood towards globalisation is shifting, and there are concerns about whether the current trade system is fair for all to benefit from as they ought to, Prime Minister Lee Hsien Loong said yesterday. But global trade has allowed many countries to prosper, he told fellow Asia-Pacific Economic Cooperation (APEC) leaders, saying he firmly believes "we should foster more and freer trade to continue to prosper". He also reiterated Singapore's support for the rules-based multilateral trading system, saying it has brought economies closer together and allowed open dialogue on issues like sustainable development. At the end of the two-day APEC Summit yesterday, leaders of its 21 economies agreed to ensure a level playing field by pursuing open markets and fighting protectionism, including all unfair trade practices. A day earlier, leaders of the two largest economies had put forward different visions of trade. United States President Donald Trump said he would pursue fair deals that put America first, while Chinese President Xi Jinping pledged support for multilateral deals and to push for more inclusive globalisation. Asked for his assessment at an interview with the Singapore media, Mr Lee said all APEC members agree on wanting to promote closer economic integration with mutual benefits, but had different views on how this should be done. While the US wants to work bilaterally on a reciprocal basis, other members want to keep to a multilateral framework "which in the view of many of us has benefited all our countries, including the US". But Mr Lee said members understood the political pressures and reasons behind the US administration's stance and still hoped to work together with the US, as well as like-minded countries. "It does not mean there is a consensus. It does not mean there is no conflict in perspectives, or no tension. There is, but we hope we will be able to work through them and maintain the cooperation that has delivered peace, stability and prosperity to many countries for a very long time," he said. In an earlier speech to APEC leaders, Mr Lee said being plugged in to the wider global market brings economies of scale, and no single country can be self-sufficient in today's world. Even then, there is still some way to go towards the ideal of fully open trade in the region. Citing the World Trade Organisation (WTO), which Mr Trump had criticised a day earlier for turning a blind eye to unfair trade practices, Mr Lee said it was an important forum for improving the global framework for trade. But it takes time for all 164 WTO members to reach a deal, "so we have to explore less comprehensive but more timely measures", he said. He called for support for the Regional Comprehensive Economic Partnership that ASEAN's 10 members are negotiating with six others, including China, Japan and India. At the same time, the remaining members of the Trans-Pacific Partnership deal were also pushing ahead to bring the pact into force. Mr Lee also said developments such as China's Belt and Road Initiative, which includes many economies across Asia and Europe, will also promote greater connectivity, infrastructure investment and economic integration. APEC, too, is a measure for promoting trade, he said, noting that the grouping had come a long way from its early days as an informal gathering of 12 economies in 1989 formed to liberalise trade across the region. Tariffs in APEC today are a third of what they were then, and APEC economies represent 60 per cent of global gross domestic product and half of global trade. He also commended Vietnam, this year's APEC chair, for kick-starting a process to review goals set in Bogor, Indonesia, in 1994, for free and open trade and investment across the region by 2020. "As we approach 2020 for the Bogor goals, it is timely to reflect on the aspirations of APEC for the longer term," he said. Governments must play an active role in ensuring the benefits of digitalisation are fairly distributed, Prime Minister Lee Hsien Loong told Asia-Pacific Economic Cooperation (APEC) leaders yesterday. While free markets and private enterprise are required to drive innovations that have opened up new frontiers for trade and commerce, efficient and fair economies are just as important, said Mr Lee. "It cannot be entirely laissez-faire," he said. "We can leave it to the markets to work this out, but there will then be much disruption and hardship as sectors undergo restructuring, and obstacles to taking advantage of the new opportunities." He urged countries to mitigate the "winner takes all" effect of technological disruption, as not doing so can result in reactions that prevent governments from promoting economic integration and cooperation. Fiscal transfers and investments in education, training and human resources can help spread the gains more evenly, he suggested. Making globalisation and digitalisation more inclusive was key on APEC's agenda this year, amid a pushback against globalisation. Mr Lee also urged fellow APEC leaders to help businesses and workers adjust as technology disrupts industries and business models, and causes some jobs to disappear. "We are seeing middle managers and professionals worrying about automation and how artificial intelligence could be displacing workers. They ask: Is AI helping them do their job better or (is it) doing their jobs and making them redundant?" To assuage their anxiety, governments can provide incentives for them to upgrade their skills, and also the right environment, frameworks and rules to allow for innovation by businesses, he said, citing Singapore's SkillsFuture for the Digital Workplace initiative for workers. "These are real political pressures which we have to deal with and, at the same time, move forward and adapt to the digital age," he said. Exactly one year to the day United States President Donald Trump withdrew his country from an ambitious Pacific Rim trade deal, the remaining 11 countries - including Singapore - agreed to move ahead on a revised version of the pact. They settled their remaining differences over the Comprehensive and Progressive Agreement for Trans-Pacific Partnership (CPTPP), dubbed TPP-11, after two days of talks in Tokyo that ended yesterday. The nations had reached a broad agreement last November, save for four unresolved issues. But these were ironed out, paving the way for the deal to be inked by early March. Japanese public broadcaster NHK reported March 8 as the date being mooted for the signing ceremony, to be held in Chile. Singapore's Minister for Trade and Industry (Trade) Lim Hng Kiang said yesterday: "Singapore is pleased by the good outcome on the CPTPP. We have made significant efforts to uphold the spirit and substance of the original agreement, while maintaining its high ambition and overall balance." Singapore companies will stand to gain, he said, from a substantial elimination of tariffs and non-tariff barriers for goods, improved access for service suppliers, greater facilitation of investments and improved access to government procurement contracts. The victory for trade liberalisation came a day after Mr Trump imposed hefty tariffs on imported washing machines and solar panels. China and South Korea plan to lodge protests with the World Trade Organisation. The TPP-11 will give Singapore companies access to a market of 500 million people with a combined output of US$10 trillion (S$13.2 trillion). Japan and Singapore are joined by Australia, Brunei, Canada, Chile, Malaysia, Mexico, New Zealand, Peru and Vietnam as parties to the deal. The treaty will take effect once it is ratified by at least six countries. The outcome, said Singapore's trade ministry, "reaffirms the CPTPP countries' collective commitment towards greater trade liberalisation and regional integration". Japan and Australia have been the flag-bearers of the deal since the US withdrawal, with prime ministers Shinzo Abe and Malcolm Turnbull pledging in Tokyo last week their "personal commitment" to sign and seal the deal by March. Under the CPTPP, 22 provisions in the original TPP will be frozen - up from 20 as agreed by negotiators last November. Most are on intellectual property, with the new clauses to do with the liberalisation of Malaysia's state-owned enterprises and Brunei's coal industry. The provision on state-owned enterprises is to ensure all businesses, regardless of ownership, can compete fairly with foreign government-owned entities on quality and price and not on discriminatory regulation, subsidies or favouritism. The other two concerns - the protection of cultural industries in Canada and a grace period for labour rights legislation in Vietnam - will be spelt out in separate letters that will be exchanged with other members at the signing. These will not be in the final CPTPP document. Meanwhile, Singapore Prime Minister Lee Hsien Loong, speaking to reporters in Sri Lanka where he is on an official visit, seemed cautiously optimistic. "We will have to see how that develops because it is politically sensitive for some countries," said PM Lee.